Through an Oxidation process, the surface of the blade's hue is enhanced and altered, creating a range of colors from black, blue, red, or a combination of two colors. Color Treatment adds uniqueness, character, and value to your katana or wakizashi blade. 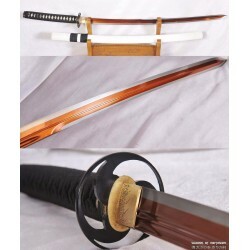 We carry a wide selection of color treated samurai swords, ninja swords, and more! Choose an individual sword to add to your collection or find the perfect samurai sword set. Each of our blades can be sharpened to a razor-edge or left unsharpened – it’s your choice. Take a look at our samurai and ninja sword selection and find your perfect color treated sword today! This sword is made of 9260 spring steel with a polished mirror-like surface. The blade is .. 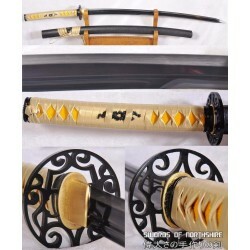 The blade is Unokubi-Zukuri style with a double edge made of through hardened 1095 high carbon .. 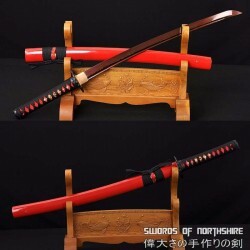 This is a well-made colorful folded steel kiriha-zukuri style ninja sword, following the tradit.. This is a very unique sword design, the blade is made of blackened folded steel with a saw-tooth cut..